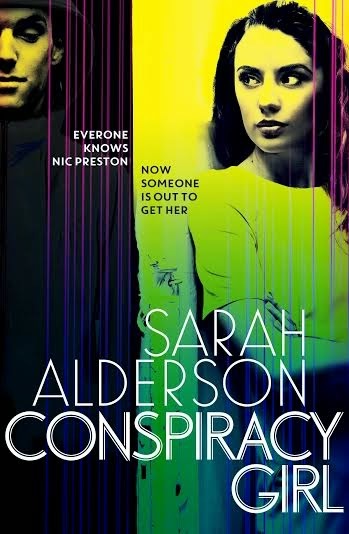 I'm incredibly honoured today to be taking part in the blog tour for Conspiracy Girl by Sarah Alderson! Sarah Alderson is definitely one of my favourite authors and I will always be excited to read her books. How would you describe Conspiracy Girl to new readers? Three years ago Nic Preston’s life was destroyed during a home invasion. She witnessed her mother and step-sister brutally murdered and overnight was thrown into the media spotlight. Three years on Nic is struggling to rebuild her life. But then her high-security apartment is broken into and it looks like the killers are back to finish the job. She is forced to hide out with Finn Carter - a hacker, rule-breaker and general player - and the same guy who testified for the defence against her mother’s killers allowing them to walk from court scot free. Together the two of them have to solve the conspiracy of who wants to kill Nic and why. It’s a really fast-paced book, taking place over just three days or so across New York and a snow-bound New England. There’s serious action, lots of tension (of the sexual and dramatic kind both) and a good old conspiracy at the heart (that’s based on a real life story). We get to see both Nic and Finn's perspective, did one voice flow more naturally then the other? Strangely I always find it easier writing the male point of view. I guess with Finn I really enjoyed the slow reveal. He comes across as arrogant and rebellious and head strong at first, but then you strip back the layers and you realise that his whole story - his childhood, the trauma he’s lived through, his ideas that were formed about justice at a young age - have made him who he is. I think writers need huge amounts of empathy. It’s a pre-requisite. You have to be able to feel what your characters have or are going through and with Finn I felt huge compassion. For Nic too but I think with Finn I just wanted to reach into the pages of the book and hug him. You've set previous stories in California, Nantucket and in New York and throughout New England. How important is setting to you and does it help shape the story? I think very cinematically (I am also a screenwriter). My whole life is basically one big quest for adventure and discovery. I love living in different places. I grew up in London and have just returned from living for the last five years in tropical Bali. Now I am living for a while in a 17th century cottage in the English countryside and it’s like something from that film The Holiday. It’s so idyllic. We won’t be here that long though before we head off, possibly to spend some time in Africa and then California. I’m addicted to living lots of different lives in different environments. It thrills me no end. So yes, setting for me is everything, not just in my writing. I always tend to base my books in places I’ve lived or at least travelled to. New York is a particular favourite city of mine - it lends itself to story-telling because the landscapes are so vivid and so grand, and the sense of place is so fantastic. Everyone has NY as a reference even if they haven’t been there because it’s been so well depicted on film. And then there’s Nantucket - which is a little island off the East coast of America. I nannied there when I was 17 which is why I then based The Sound there (it’s about a British girl who nannies there one summer). California is my second home - it’s where I’m happiest, where I feel most relaxed and free. I love the light there and the ocean. It’s where I set Hunting Lila and Fated. There were some quite traumatic scenes in Conspiracy Girl including a home invasion. Was there any particular scene that you found really difficult to write or that you kept returning to? I did rewrite the home invasion scene about four times as I was striving to get the right sense of terror without being too terrifying (it’s YA after all) and the most realistic depiction it as I could. I researched a lot. I read newspaper reports and other articles about real home invasions - one of which was so incredibly awful it scarred me mentally and I also did my homework on security systems. It was great to see a mention of previous characters from Out of Control in Conspiracy Girl! Is this interconnectivity new or had I missed it previously? Will we see glimpses of Nic and Finn in future projects? What IS next for you? I’m not sure! Possibly not. I’m moving away from Thrillers to more straight romance. In my short story Tormenting Lila the characters from The Sound appear. So sometimes I do like to cross check books. It makes me smile to myself to leave little traces and I hope fans pick them up too. In my new adult books which I write under the name Mila Gray I take a b character and then make them the main character of the next book - though the books are standalones. I think that’s a fun way of doing it as you don’t have to read a series but you get little teasers and to catch up with characters you’ve loved, albeit briefly. Human trafficking in Out of Control and now the ethics behind diamond mining in Conspiracy Girl, what draws you to intertwine these social justice subjects into your stories? Is there a topic you would like to tackle next? I am always scouring the news for interesting articles that I then bookmark and mull o. I’m a feminist! A fully paid up member of Fawcett (a charity that fights for gender equality) and I’m passionate about women’s rights among many other things. I used to work for a charity as a head of projects - and all our projects were designed to tackle some form of social injustice. I think writers have a responsibility to their readers and I love being able to slide issues into my books that my audience might not have come across or may not know much about. Not many people in their teens will probably pick up a hard hitting book about human trafficking but they might pick up a fast paced thriller romance, and then they might discover something about a topic they didn’t know much about. It’s my cunning attempt to help promote a cause I’m passionate about (ending human trafficking). As for what’s next, my second Mila Gray book (out in August) is about a wounded Marine and the psychology student he meets at the hospital he’s in. It tackles mental health issues and war - but my next YA won’t be a thriller and I think I’ll tackle something more individual, more private. We’ll see! Conspiracy Girl was one of my most anticipated reads of 2015, what are you most looking forward to reading this year? Oh my goodness! You should see the books on my bedside table. I’m really looking forward to reading Lena Dunham’s book Not That Kind of Girl and also Elena Ferrante’s My Brilliant Friend. I also just received a copy of Everyday Sexism from Simon & Schuster (one of the lovely perks of being an author is that I do get some lovely books sent to me when I ask nicely) which I can’t wait to get started on. Sarah is the author of Hunting Lila (winner of the Kingston Book Award), Losing Lila, Fated, The Sound, Out of Control and Conspiracy Girl (all Simon & Schuster). Having spent most of her life in London, Sarah quit her job in the non profit sector in 2009 and took off on a round the world trip with her husband and daughter on a mission to find a new place to call home (a journey that was documented on this blog and which is shortly to be turned into a book). After almost a year spent travelling the world, they settled in Bali where they lived for five beautiful years before the vagabonding urge became too great and they decided to embark on Can We Live Here part two. They are currently located somewhere between India, London, Canada and the US. As well as writing young adult novels and screenplays, Sarah also writes adult fiction for Pan Macmillan (Simon & Schuster in the US) under the name Mila Gray.